These are just a few of the more complex and challenging projects i-Link has undertaken, highlighting some powerful and novel ways to engage with respondents online. Our brief for this project was to provide a complex choice model to participants in which the model was intelligently adapted to simulate a 'real response'. For this project, participants were asked to view a series of employment contracts and to provide an indication of whether they would accept or reject the contract being presented. Based on the participant's initial input our system then used a mathematical formula provided by our client's choice modeller, to artificially determine a 'revised contract'. Contracts were adjusted in this way a number of times until a final contract offer was accepted by the participant. As shown above, screen presentations included the ability to provide instant feedback on the preference between the 'artificial employer' and the participant's choice as a final contract was being negotiated. Case Two: A New Way to Shop! In this example, our client asked us to build a question, styled to their specifications, which would visually replicate point of sale shelving. The 'shopping style' question below used rollover and drag & drop techniques so participants would be engaged in the choice scenarios. The question enables products to be displayed on a number of shelves. Participants simply pass their cursor over the item displayed on the shelf to view a larger picture with specific details on the product - which is displayed on the right or left of the screen. 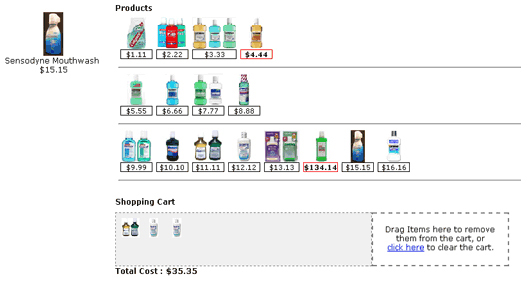 Items are selected when dragged into a shopping cart which tallies the total amount being spent. The system can also validate a range to be spent. i-Link has developed this question style based on our clients' needs. In this case, as with others, we agreed to absorb the cost of development so we could incorporate the design into our standard offer. This project was an adjunct to the project detailed in Case One: Artificial Intelligence Meets the Consumer. Our brief in this instance was to use the same statistical modelling that was used previously but to present data as either textual or graphical. Researchers were interested to find out if either of these methods would produce a different result. 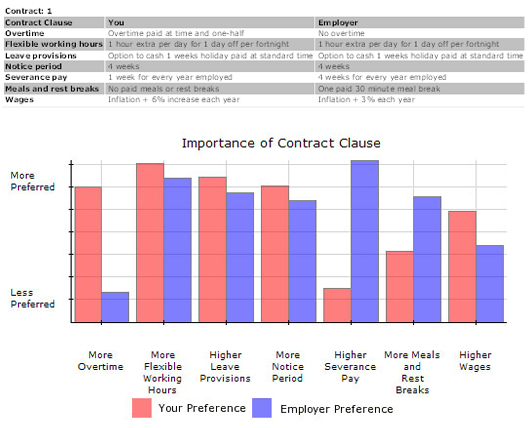 Matched participants in this monadic design were either shown a textual representation of an employment contract or a graphical representation (see images below). Our system was able to effectively take the same information and display it differently as the research required. i-Link Research has highly experienced researchers and programmers with the expertise required to design, implement and field any project required. As demonstrated by the case studies above, our systems have been intentionally developed to enable easy integration of novel research designs to our application's core validation methods and controls, resulting in hassle free research solutions that work. Read what some of our clients have to say about us by clicking here.